There was a time when running the mile in four minutes was believed to be beyond the limits of human foot speed, and in all of sport it was the elusive holy grail. In 1952, after suffering defeat at the Helsinki Olympics, three world-class runners each set out to break this barrier. 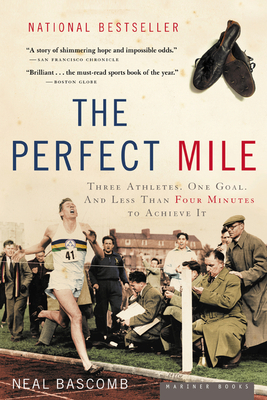 Roger Bannister was a young English medical student who epitomized the ideal of the amateur — still driven not just by winning but by the nobility of the pursuit. John Landy was the privileged son of a genteel Australian family, who as a boy preferred butterfly collecting to running but who trained relentlessly in an almost spiritual attempt to shape his body to this singular task. Then there was Wes Santee, the swaggering American, a Kansas farm boy and natural athlete who believed he was just plain better than everybody else. Spanning three continents and defying the odds, their collective quest captivated the world and stole headlines from the Korean War, the atomic race, and such legendary figures as Edmund Hillary, Willie Mays, Native Dancer, and Ben Hogan. In the tradition of Seabiscuit and Chariots of Fire, Neal Bascomb delivers a breathtaking story of unlikely heroes and leaves us with a lasting portrait of the twilight years of the golden age of sport. NEAL BASCOMB is the national award-winning and New York Times best-selling author of The Winter Fortress, Hunting Eichmann, The Perfect Mile, Higher, The Nazi Hunters, Red Mutiny, among others. A former international journalist, he is a widely recognized speaker on the subject of war and has appeared in a number of documentaries. He lives in Seattle, Washington. For more information visit http://nealbascomb.com, or Twitter @nealbascomb.